India’s largest DTH operator: Tata Sky has finally revealed the new packs for choosing channels, under the new Cable TV regulations. This came after TRAI scolded Tata Sky for not announcing the new packs, despite repeated alerts and warnings. Tactically speaking, this is can be regarded as a good move, as only a week is not remaining for implementing the new Cable TV rules, and now, Tata Sky customers will have to choose the new packs, within this deadline. While announcing the new packs, and explaining why Tata Sky was so late in announcing the new packs, Tata Sky CEO Harit Nagpal revealed that they are offering 400 packs for different audience segments, across different niches. 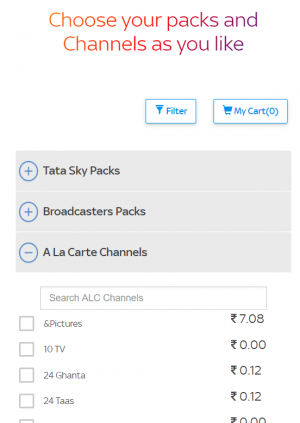 All new Tata Sky packs can be accessed via packselection.tatasky.com, where their customers need to login first. The UI and functionality of this portal is clean, and helpful for the users to choose their favorite channels, via the different packs. There are three ways this can be done: a) Customers choose their own channels, based on à la carte mode, that is choose their individual pay channels, which will become part of the 100-channel base pack. Choose the packs offered by Tata Sky, as they have offered more than 400 packs. Choose the packs offered by the broadcasters. However, one negative news is coming out regarding Tata Sky’s new packs: All annual and long term plans have been canceled. In the last few months, Tata Sky had been promoting their annual, long term plans to their customers. Several of them assumed that if they choose such long term plans, they will be rescued from TRAI’s new Cable TV regime, as the old plans will be in force. But now, as Tata Sky has removed the annual plans, these customers are in a fix. Tata Sky has assured all they the money will be deposited back in their respective accounts. Now, the customers who have chosen the annual, long term packs will have to continue to use Tata Sky, until their money is exhausted under the new plans. Now, earlier, Tata Sky used to offer almost all channels for Rs 500-600, but now, this arrangement won’t work. Hence, this decision to cancel all annual, long term packs by Tata Sky makes sense for the company. It would be interesting to observe how customers react now.